Get that little birthday boy's heart racing with this free printable birthday car featuring a bright red race car on the front cover. It would even work for an older young-at-heart man's birthday card. The red car appears to be bursting right out of the paper to wish them a happy birthday. 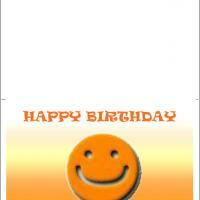 The bold colored background of red, blue, and orange is the perfect backdrop for a fun birthday greeting. The fun continues inside with a car racing themed message. 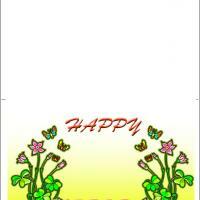 You are welcome to custom print this card with an added personal message too. Print this card from your personal computer today. 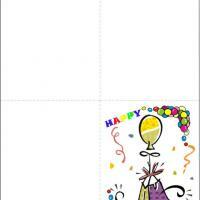 Little boys will love these printable birthday cards. Dominated by a red race car theme, these free printable cards are ideal for little boys and probably a few little girls too! It is the perfect card for your older friends as well. After printing the card, help your kids add some personal touches such as stickers and other colored images they like before sending this card to all of their friends. You will race your way to being the best friend ever with these fun birthday cards to include with a party present. Print one-or as many as you need-today! We are sure you have some racing fans on your birthday list that will enjoy this race car themed card that was inspired by the Lightening McQueen car character from a popular kid's movie. The red sports car is bursting through the cover leaving a trail of orange just to be the first to wish them a happy birthday. 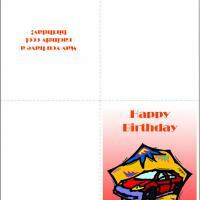 The bold red background will grab their eye and lead them to turn the page and read the race car cool birthday greetings. 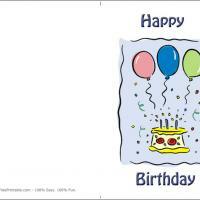 Cool will be your middle name when you select and send this free printable race car birthday card today.